Wastewater — Air, Water & Soil Labs, Inc.
Water discharged from industrial, municipal, or agricultural sites may be monitored according to environmental permits. 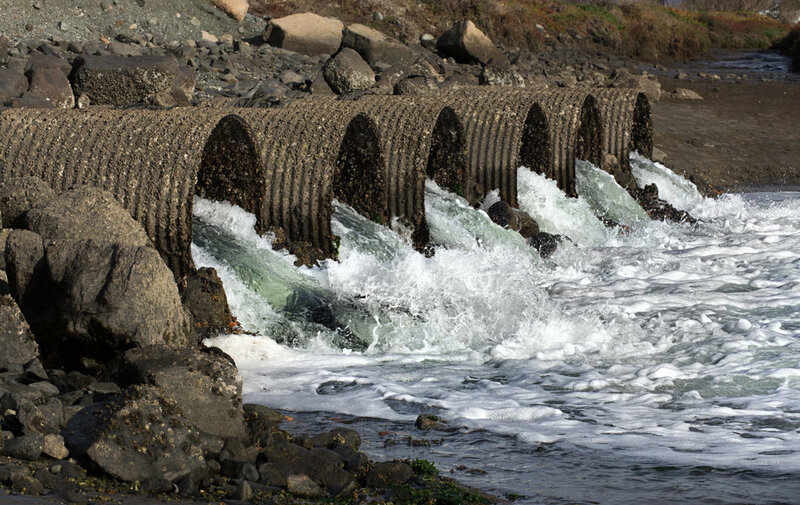 Industrial wastewater maybe permitted to discharge into a waste system that drains to a wastewater treatment plant or it may be discharged directly into the environment by a National Pollution Discharge Elimination System (NPDES) Permit. Both types of wastewater removal have unique regulatory requirements and may require special analytical techniques; byproducts of any industrial process can introduce matrix effects that must be considered when processing lab samples. Municipal wastewater treatment plants (WWTPs) are critical features of any community’s infrastructure. These facilities remove solids, chemicals, and organisms from a wide variety of waste streams. This treated wastewater can be discharged according to local, state, and even federal regulatory permits; the lab serves to independently verify the quality of the wastewater as it’s treated and discharged. Most don’t consider rain or stormwater as a potential pollutant - but when it flows over impermeable surfaces or into dirty culverts or drain systems, it can quickly become a source of contamination. The EPA recently released Municipal Separate Storm Sewer System (MS4) and Stormwater Pollution Prevention Plan (SWPPP) guidelines. Stormwater has quickly become an important part of the environmental landscape.